The literary and textual axis of IDEA is composed of scholars who are interested in texts not only as means for conducting literary or poetic analysis, but also as objects that can be studied in their own right, as material sites of readerly and writerly activity, and as part of the process of book production, distribution and reception. This field of study thus considers the text not only from the point of view of the author and the reader, but also from those of the publisher, the editor, the book distributor, the translator and the illustrator. The activities of this axis are directed and co-ordinated by Nathalie Collé-Bak. The scholars working on literary and textual questions within IDEA make use of the reflections on interdisciplinarity that have been at the heart of the research group’s activities since 2005, bringing them to bear on a study of textual itineraries and book history. This research axis has grown out of a decade-long history of research into English language literature at Nancy 2. At the same time, it represents a repositioning of literary research within IDEA, in an effort to engage in a truly interdisciplinary study of the textual and book objects. From June 21-23 2012, the literary and textual studies axis of IDEA will be organising an international conference entitled ‘From Text(s) to Book(s)’, in association with SHARP (The Society for the History of Authorship, Reading and Publishing). The deadline for proposals to this conference is 15 Decembre 2011. 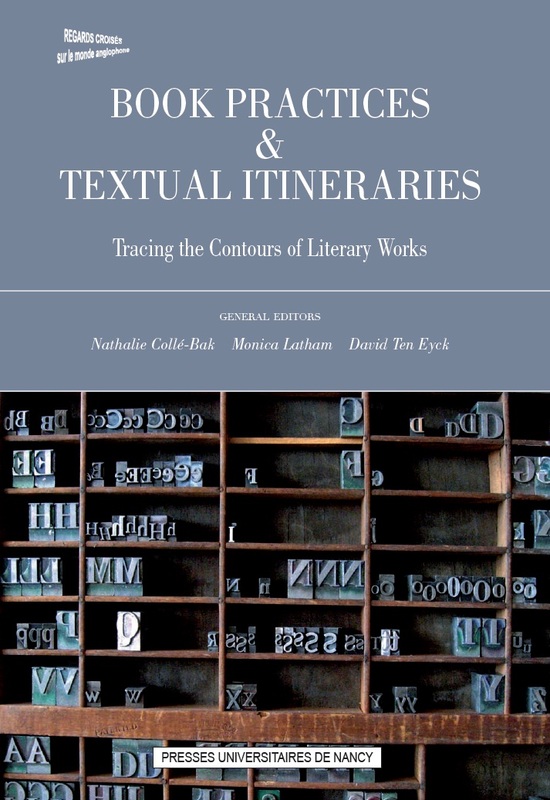 In June 2011 the Literature and Textual Studies axis launched a book series entitled Book Practices and Textual Itineraries, published under the general editorship of Nathalie Collé-Bak, Monica Latham and David Ten Eyck, with an editorial advisory board that brings together specialists of book history and textual studies from around the world. The first volume in this series explored the question of the “contours of literary works”. The publication of a second volume, “Editing Modernist Texts” is planned for 2012. In 2012-13 the Literature and Textual Studies axis will be organising a series of seminars entitled ‘Editing as/& Interpretation’. The programme of these seminars will be published in June 2012.